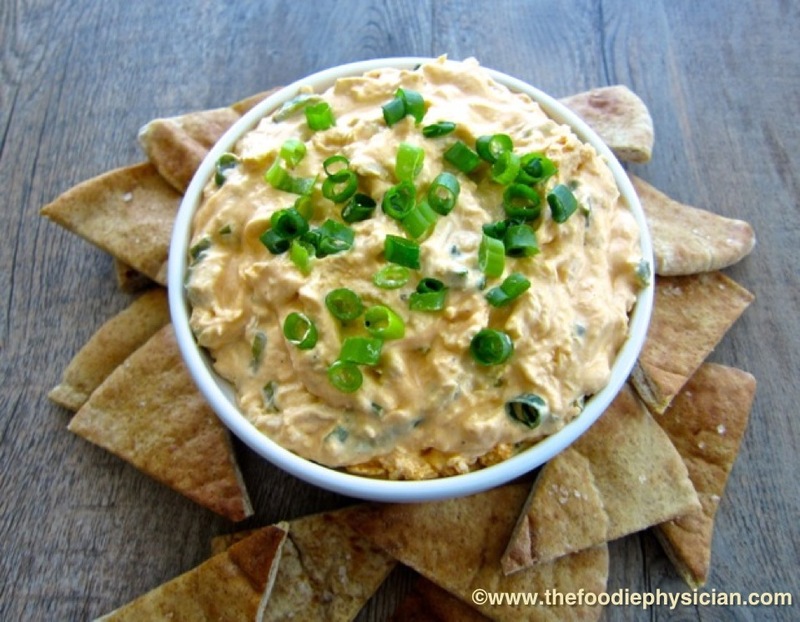 My Lightened Up Buffalo Chicken Dip is a healthy remake of a classic dish and is the perfect addition to your game day menu. With Super Bowl Sunday around the corner, you may be starting to plan your game day menu. Few foods are as commonly associated with this occasion as buffalo wings. 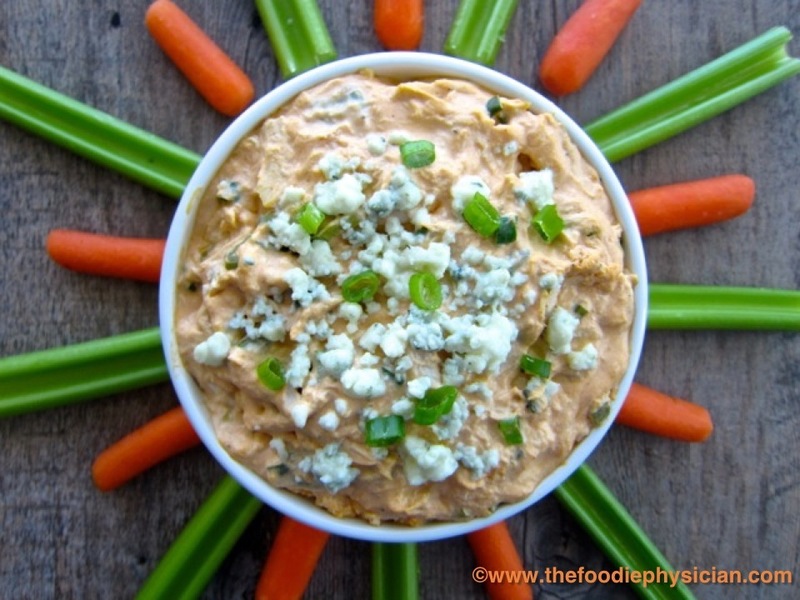 Buffalo chicken dip is a popular variant of this classic dish and incorporates all of the flavors of buffalo wings into a warm, creamy dip that goes perfectly with fresh veggies and chips. Swap in Neufchatel cheese instead of traditional cream cheese. It has less calories and 1/3 less fat than regular cream cheese but still has great flavor and a nice creamy texture. It melts very well and is a good healthy option for dishes such as hot dips and creamy pasta sauces. Nonfat Greek yogurt instead of bottled Ranch or Blue Cheese Dressing. Greek yogurt adds a great tangy flavor that complements the spicy hot sauce but with none of the fat and only a fraction of the sodium of bottled dressings. Plus, Greek yogurt is naturally thick and creamy (even the nonfat variety), packed with protein and low in carbohydrates. To read more about Greek yogurt, CLICK HERE. Dried spices to add flavor. Because I don’t use a prepared salad dressing, I up the flavor by stirring in dried spices like garlic powder and onion powder. This also cuts down on sodium. Remember to use garlic and onion powder, not garlic or onion salt. 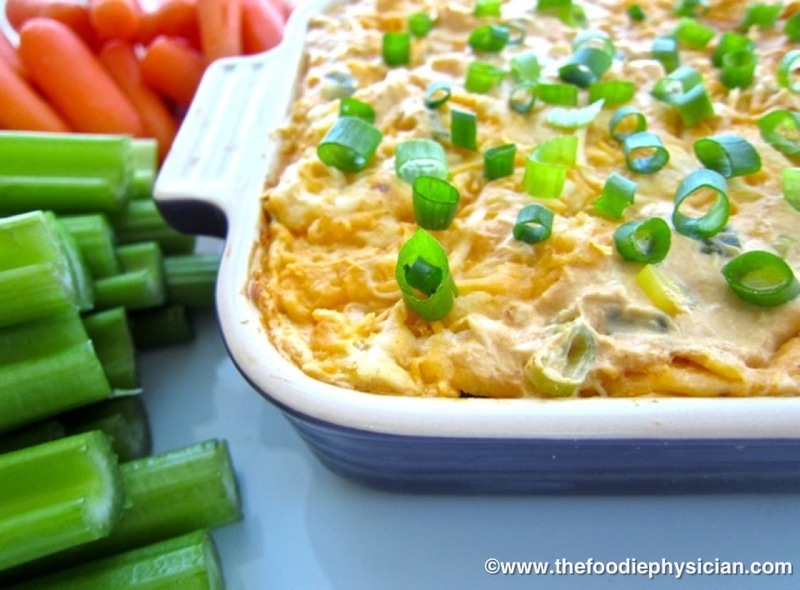 So try this quick and easy Lightened Up Buffalo Chicken Dip on Super Bowl Sunday or for your next party. You can even prepare the whole thing in advance and simply heat it up when your guests arrive. It’s definitely a crowd pleaser and your guests will love it even more when you tell them that it’s healthy! This healthy remake of a classic dip is the perfect addition to your game day menu. Pour the dip into an 8-inch square baking dish and bake for 15-20 minutes until bubbly. If using shredded cheddar cheese, sprinkle the cheese on top before baking. If using crumbled blue cheese, sprinkle the blue cheese on top as soon as you remove the dip from the oven. Garnish with sliced scallions. Serve with baked pita chips or celery and carrot sticks. My Spiced Pita Chips are the perfect accompaniment to this dish. CLICK HERE for the recipe. I am going to make this over the weekend! Thanks – it sounds wonderful! very colorful dip! it looks scrumptious! I would like to make this tomorrow but do not have chicken. Could I skip the chicken? Or maybe use tuna that I have on hand instead? Thanks. The chicken is one of the main ingredients in this dish so I haven't tried the recipe without it. Tuna would probably be a good alternative. You may want to avoid the blue cheese if using tuna, it may not be the best combination of flavors. Let me know how it turns out! You say one serving is 70 calories… How much is one serving? 1/4 cup? 1/2 cup? 2 Tbsp? The recipe makes about 3 1/4 cups, so one serving is 3 1/4 tablespoons. Thank you very much. I've finally "perfected" my homemade Greek yogurt and use it for almost anything with a creamy texture. Not a fan of bottled dressings either, this very well may make an appearance today. Love your recipe resuscitations as they often make me think outside my usual healthier substitutions. 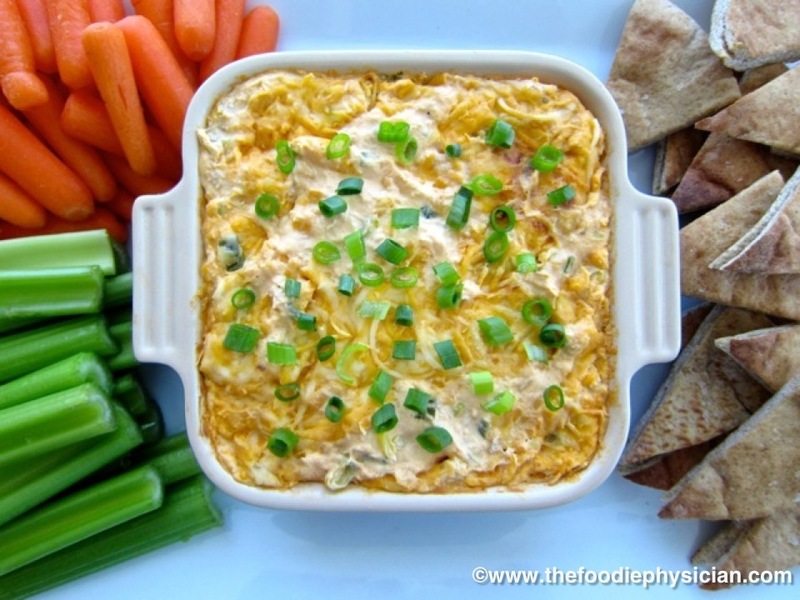 We really enjoyed this, my husband without knowing this was a healthier version said this was the best buffalo chicken dip he ever had! Thank you for the tip on a lighter version of cream cheese and replacing Greek yogurt for bottled dressing. We love Greek yogurt. I made this on the stove today–better than the original! I still used lowfat sour cream. I looked at the ingredients in ranch dressing mix, which most recipes call for. Since that contains buttermilk, I decided to add about 2 tablespoons of powdered instant buttermilk to mine. This still looks like a lot of sodium — I wonder if there are lower-sodium alternatives for the Frank's and Neufchatal — ?